Huh. Well, you don’t see this everyday. Just a month ago, Daniel Bongino was willing to take a bullet for President Obama. 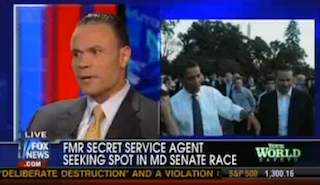 Now he’s on Fox News talking about the the problems with the “institutional left.” Bongino just left his 12 year and two president career as a Secret Service agent to try and get the Republican nomination in the tough race to unseat Maryland Sen. Ben Cardin in 2012. Today, he explained to Neil Cavuto why he made the switch. While a lot of Bongino’s answers weren’t that different from those he’s been giving since the announcement of his candidacy earlier this week, there’s still something intriguing about seeing a former Secret Service member speaking candidly about the policies of the president and his party. After Bongino went after the lack of results in the unemployment problem, Cavuto pointed out that he’d kept this quiet for a while.